So it turns out that this is the time of year where all of my favorite artists decide to come out from hiding and do things like attend festivals and conventions and put out new work. Needless to say I'm quite too poor to do all things I wanted to do this fall. I'm not able to attend NYC Comic Con and it turned out I didn't have the funds to travel to Maryland to go to SPX like I wanted to. However, I think I made out pretty good with being able to see and get some pieces from some of my favorite artists. 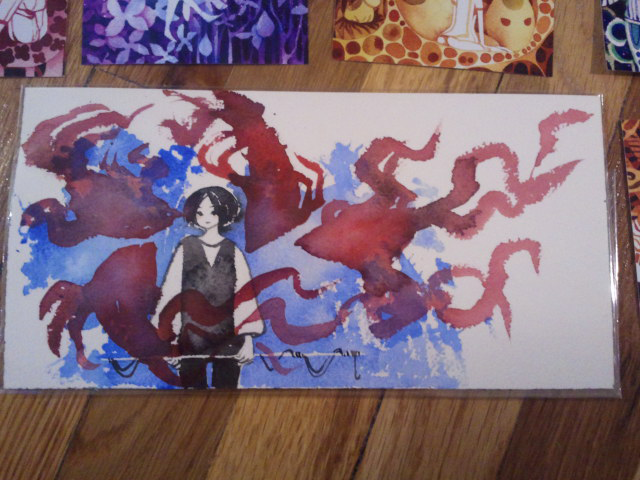 Friday I was surprised to find that an original watercolor piece I ordered from Koyamori (her real name is Cynthia) finally arrived in the mail. I was even more surprised to find that it came in a cute personalized envelope with a nice little note and a couple of postcard sized prints for free! I've followed Cynthia for years on Deviantart and now follow her updates via her tumblr site. She is extremely talented and prolific. Cynthia, along with an artist named Aya Takano (whom I've mentioned on this blog before) are my biggest influences when it comes to inks and watercolors. I'm so excited to have an original piece of hers and can't wait to get a frame for it and hang it up along with so many other pieces I've collected from other artists I admire. All the other goodies I got from her! If you like what you see, she has many other original pieces as well as prints and stickers available for purchase on her online store. Also on Friday I got the chance to go to this awesome event put on by the Brooklyn Book Festival featuring Los Bros Hernandez. At the event the brothers Jaime and Gilbert Hernandez, did some live drawing, talked a little about their process and their experiences making comics, and did a Q&A. 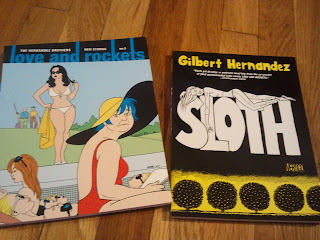 I've, unfortunately only read a relatively small selection from their many many stories (they published their first Love and Rockets book in 1982). However, they are huge inspiration in my comics making. I admire their ability to tell the stories they want to tell and not have to bend to the comics industry standards. Their artwork is beautiful, I absolutely love their style of drawing. So, anyways, the event was a lot of fun and inspiring and afterward I got the chance to meet them briefly and tell them how much their work meant to me. I also got two more books to add to my collection! So last night I got the chance to see another comics idol of mine, Julia Wertz! This event also put on by the Brooklyn Book Fest featured seven comics artists including Julia Wertz all reading pieces of their most current work along with slides of the artwork. It was an absolute dream to see Julia in person, she was very funny and often made little side comments about things she was thinking about or how she felt while writing or experiencing particular stories. 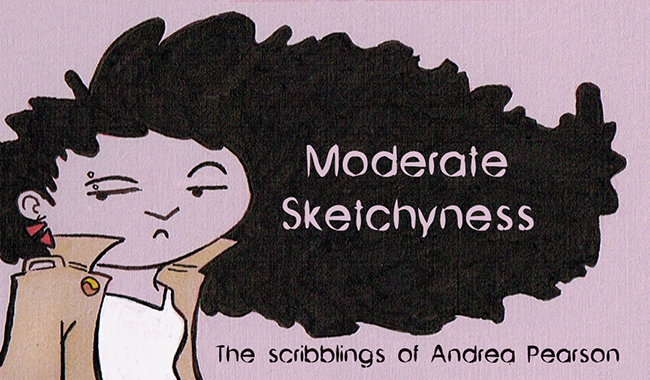 I love how honest her work is and she has been a huge inspiration in my own journal comics. I only wish I was half as funny as she is. 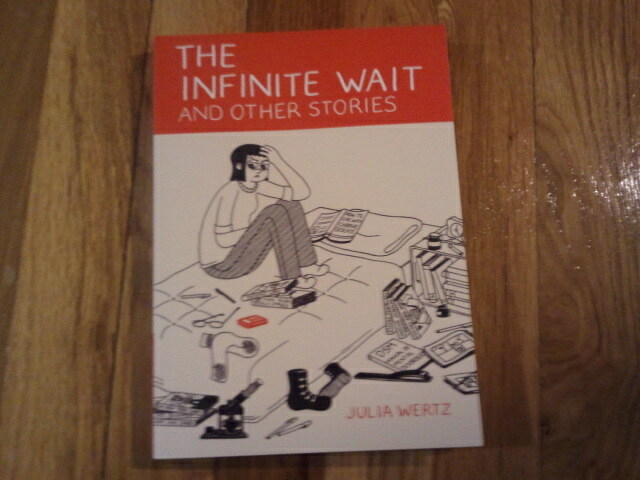 Anyways, I got to walk out of the event last night with her newest book, The Infinite Wait and Other Stories. 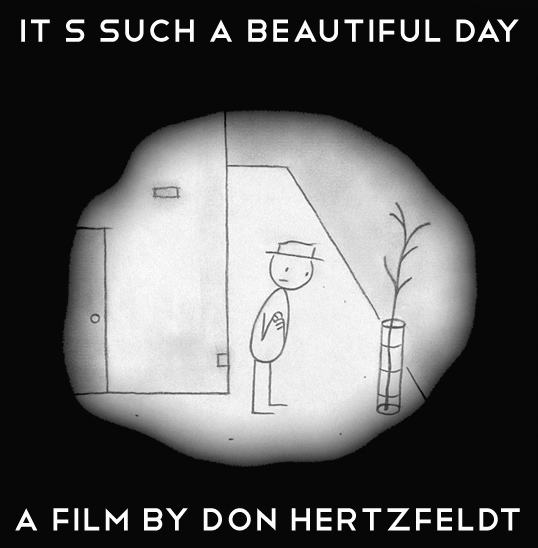 And lastly, even though it won't arrive in the mail for another month, I should mention that just the other day I pre-ordered Don Hertzfeldt's new DVD, Don Hertzfeldt vol.2, which includes his short animated trilogy turned feature film It's Such A Beautiful Day. As much as Don Hertzfeldt will consider himself a filmmaker as opposed to an animator, he has been one of my main animation/filmmaking inspirations. It's Such A Beautiful Day is a beautifully tragic yet funny trilogy and I can't wait to see all three films together as one. I've gotten the chance to meet and see Don live in person a few times and the reason he is so inspiring is that he just always keeps creating. He puts out film after film and uses the money he makes on one film to fund the making of his next film. He has to be insane with the amount of work that he puts into animating especially since all the animation is hand drawn on paper, filmed on film, and all the effects are done in camera using double exposure and other fun camera tricks. I can't express enough how crazy the man must be, but regardless he loves what he does and his persistence is inspiring. So I recently participated in a comics exchange hosted by the website reddit.com. Not sure if any of yous guys are familiar with the website, but their gift exchange program recently won a Guiness Book of World Records award for largest world wide secret santa exchange. Anyways, along with doing the secret santa exchange they also host a slew of other themed gift exchanges. Now back to my story. 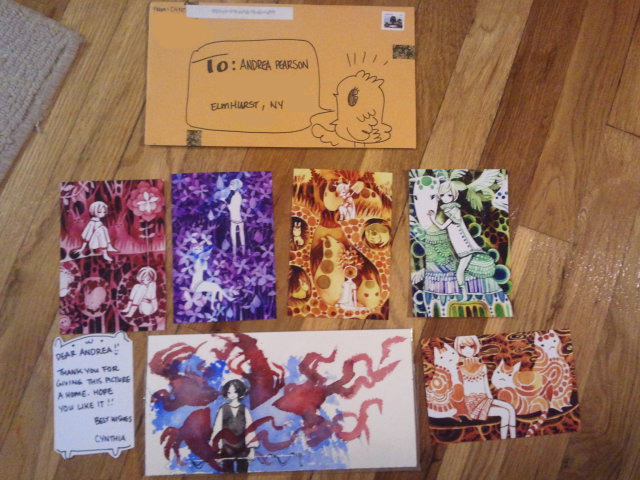 For my gift exchange match I decided to draw them a comic along with the comics that I sent that for them to read. Below is a snippet of the comic I sent to the person who just so happened to also live in NYC. 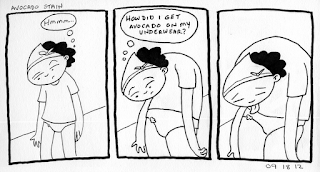 Since I am talking about comics I thought I might just post the little daily comic I drew today. 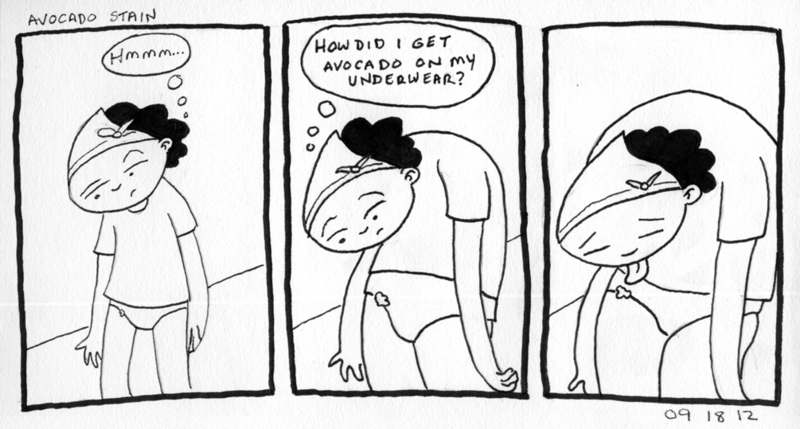 I said before that back in July I restarted drawing a daily journal comic. I have no intention of posting them with any kind of regularity. I just wanted to post this one today.